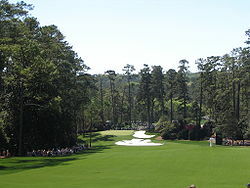 Yes John Updike played it, golf that is and the likes of Bill Clinton and Barack Obama play golf, though Hillary Clinton would not be able to gain membership to the venerable Augusta National Golf Club, whose hosting of the Masters has come under attack for its male only policy. Though the Times recently reported on some rare changes in golf's protocols ("Change 267 Years in the Making: A Tweak in the Rules of Golf", NYT, 10/27/11), Golf is the direct opposite of Occupy Wall Street to the extent that it, perhaps more than any other sport, epitomizes the spirit of laissez faire capitalism and of the status quo.Max Weber’s book The Protestant Ethic and the Spirit of Capitalism could easily be re-titled, The 18th Hole and the Spirit of Capitalism. Golf courses are where the robber barons of today network with other robber barons. From the caddies whose job it is to carry a golfer's bags to the steppinfetchit locker room attendants and rigid dress codes that are strictly enforced in opulent club houses, golf radiates a hive mentality. The scrappy immigrant who has worked his way up the ladder lands at a golf club where he is treated with a deference usually accorded to royalty. It’s no wonder that most golf clubs exude a pomp that is reminiscent of Buckingham palace. Sure there are public courses which cater to those who are not members of these exclusive clubs, but let’s face it, that’s not what we mean when we talk about golf. Golf courses have little if nothing in common with the asphalt oasis, the basket ball court, or even tennis, whose effete precincts have more effectively been infected with the virus of democratization. Even the apparatus of golf reeks of privilege with the heads of the drivers, the so called woods, covered in soft velvet, velour or leather hoods that give them the cache of Faberge Eggs. If there ever is a revolution that topples the power elite, golf will likely be the first and only sport to go. OK there’s polo which is played in Palm Beach, but it’s got too few adherents to make a dent.